Thank you to all participants, sponsors and exhibitors who made this conference a very fun and exciting day. This year was one of MACC's largest conferences ever surpassing 880 people. We are proud of this success and happy to continue to bring the needed education you desire. See you all at Fall Conference on October 19, at Devens Common Center. Join more than 800 conservation commissioners and agents, environmental officials, consultants, attorneys, students, activists, and others at the MACC Annual Environmental Conference 2019. Learn, ask, understand, network, enjoy the day, and bring home information you can use. Connect with people from across New England working to protect wetlands and open space. Be part of the conservation community at the largest annual environmental conference of its kind in New England! * MACC’s Annual Environmental Conference 2019 is approved for four (4) continuing education credits under the Society for Ecological Restoration’s Certified Ecological Restoration Practitioner (CERP) program. Please inquire at the conference. *Massachusetts Licensed Forester Credits are also available to attendees. Please inquire at the conference. Choose your workshop in each of the sessions. There are 31 workshops to choose from. Get updates and expert insights on laws, regulations, policies, procedures, and technologies that are important for natural resource protection and climate change mitigation. There is important information for new and experienced commissioners, environmental consultants, attorneys, concerned conservationists, and state officials. Learn from the experts while networking with your peers! There will be 4 Fundamentals Units offered at AEC 2019. Choose a morning and/or afternoon Fundamentals for Conservation Commissioners training unit. Get closer to completing, or complete, the units you need for a certificate! Attend the opening session before the start of the conference. Help honor the recipients of this year's prestigious Environmental Service Awards, participate in the Annual Business Meeting, and enjoy the keynote speech on climate change. Visit more than 45 exhibits at the conference! Speak with the exhibitors, network with experts in many fields, and learn about the latest in science and technology offerings. Bring home some goodies. Interested in exhibiting? Please sign up HERE. 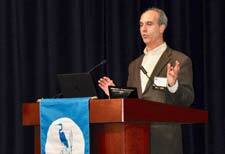 This year's keynote address will be given by Gary Clayton, the President of Mass Audubon. Mr. Clayton has provided leadership roles at the Massachusetts Executive Office of Energy and Environmental Affairs and the Massachusetts Department of Environmental Protection, where he developed and implemented policies and programs for the enhanced protection of our state's freshwater and coastal wetlands. His subsequent gubernatorial appointment to the state's Water Resources Commission furthered his role in managing critical resources upon which we all depend. He has provided service to Concord as a member and chairman of the Board of Selectmen, Conservation Commission, Planning Board, and Community Preservation Committee. He also serves as assistant Town Moderator and was a trustee of his community's local land trust. Gary's academic achievements include an undergraduate degree in wildlife biology and a graduate degree in marine fisheries biology. Mr. Clayton will discuss climate change adaptation challenges and the role of conservation commissions and wetlands experts to mitigate climate change and protect our natural resources. Be sure to join us for an interesting and thought-provoking speech! Browse the MACC book tables, which will include several new selections. Bring home books on hiking trails in New England; winter botany; tree, shrub, lichen, or bird identification; wetlands identification; our beautiful new bird, bee, and wildlife notecards, or our popular Rite-in-the-Rain notebooks. These books and cards make great gifts for family and friends. Visit the Third Annual Student Poster Session! Meet the newest generation of environmental scientists and speak with them about the projects they are featuring at the session. This year we have three cash prizes for the best posters! (Thank you Epsilon and Wetland Strategies and Solutions, LLC). Back by popular demand, MACC is hosting its second annual Silent Auction. Bid on awesome items (from MACC training, Red Sox and Bruins tickets, ski passes, bird houses, and more)! The Silent Auction will be open throughout the day for bidding, and winners will be announced during the President's Reception at the end of the day. Although unlikely, MACC may cancel AEC 2019 for inclement weather if the location of the conference, The College of the Holy Cross, is closed on March 2, 2019, due to inclement weather or if the Governor of Massachusetts has instructed people not to travel on the roads on March 2, 2019, due to inclement weather and road conditions. If AEC is cancelled due to inclement weather, MACC will issue refunds minus a $25 processing fee per registration. Notice of cancellation will be posted on MACC's website and email notice sent. The College of the Holy Cross: "The use of the facilities of the College of the Holy Cross for this event does not constitute an endorsement by the College. The College of the Holy Cross does not endorse any candidate, or organization, in connection with this or any political campaign or election". AEC 2018 Look Back: Ken Kimmell presenting his keynote address about climate change adaptation challenges and the role of conservation commissions and wetlands experts to mitigate climate change and protect our natural resources.